Configure and clear the URL History & Browser Cache (Temporary Internet Files). Many readers will not be familiar with these aspects of their browser or even how to perform these tasks, all of which are actually quite simple. To help you get started protecting your privacy and security online, this introductory page contains tips and info to guide you through the basic browser configuration tasks that you should perform. This page also points you to some readings on the web that explain why a user like you might want to perform these tasks. Although most major web browsers are substantially similar to each other in many respects, there are differences. Thus, it's important to know which web browser and what version you're using. All of the companion pages to this page (see below) contain instructions to help you figure out which browser version you're using. Most web browsers give you detailed version information when you click Help >> About from the menu bar. You can read those pages independently of this page, or you can move on to the introductions to each topic on below and then go to the appropriate sections of the companion page for your browser when you need more information. If you're using the AOL web browser, you are, in fact, using Internet Explorer underneath, even if you never realized it. On the Internet Explorer companion page, we'll show you how to find the version of Internet Explorer that your AOL web browser is relying upon as well as how to access privacy and security settings from within AOL. This is the easiest set of tasks to perform to protect your privacy and security. Both of these tasks involve deleting junk that your browser accumulates as you surf the web. The URL history is a list of the URLs (addresses) for the web pages that you visit so that you can return to those pages later. In short, it's a history of the web sites you visit. This history list is what you see when you hit the dropdown list for the address bar at the top of your browser or use your back button (Internet Explorer) or Go button (Netscape). The browser cache is a temporary storage location on your hard drive where your browser keeps copies of the web pages that you visit (including all the text, images, sounds, and videos that make up those web pages). Your browser keeps copies of the web pages that you visit so that it can bring them up quickly should you want to return to them, instead of downloading them all over again. It's much faster to read a copy of a web page off your hard drive than it is to download that page fresh. Privacy: that browser cache and URL history are essentially two different types records of what you do and where you go on the Internet, and anyone with access to your machine can use what they find in your browser's cache and URL history to learn a lot about you, what your interests are, and what you've done on the Internet -- that's a potentially serious invasion of privacy. A short note about terminology: I've referred here to something called a browser cache. A cache (pronounced "cash," not "catch") is simply a temporary storage area. Computers use caches to temporarily store data until they can be moved to some other location. Your computer and its software use many different types of caches for different reasons (usually to improve performance). For this discussion of browser privacy and security, we'll be talking about one particular cache that your browser uses to temporarily store copies of web pages that you visit. That's called the browser cache. Internet Explorer doesn't use the term browser cache, however. It uses the term Temporary Internet Files instead. A browser cache and Temporary Internet Files are, in fact, the same thing -- they're just different names for the same cache. All major web browsers allow you to clear the browser cache and the URL history separately. see the Internet Explorer companion page HERE. see the Netscape Communicator companion page HERE and HERE. Netscape 7.0 companion page HERE and HERE. see the Mozilla companion page HERE and HERE. Firefox companion page HERE and HERE. the Opera 6.0/7.0 companion page HERE. 2. Configure & Delete "Cookies"
Cookies are small "data tags" that store unique identifying information from web sites so that those web sites can recognize you when you return. In a sense, they're like name tags for your browser (but they don't literally have your name in them). If you've ever shopped at a web site and then returned at a later time, you probably noticed that the web site seemed to recognize you when you came back. They recognized you because the web site planted a unique cookie on your hard drive. You might have also registered with a web site so that you could view special content on the site; each time you returned to the site, the web site let you right in instead of forcing you to log in every time (web mail services like Hotmail or Yahoo! often do this). The web site could let you in automatically because it recognized you from the cookie it stored on your hard drive. other data: the numbers you see at the bottom contain more information such as the date the cookie was set, the expiration date of the cookie, and other info the web site might want to embed in the cookie. That's it. That's all a cookie is: a small amount of data that web sites place on your computer to help recognize you when you return to those web sites. You'll notice that these cookies (one per line) contain the same information as the cookie we looked at above. Netscape, Mozilla, and Firefox cookies are the same as Internet Explorer cookies -- they're simply stored in slightly different ways on your hard drive. So, What's the Problem with Cookies? If cookies can be so useful (doesn't everyone want to be recognized once in a while? ), why would anyone want to turn them off or delete them? The answer is simple: to protect one's privacy. We all like to be recognized in some situations -- being recognized can be convenient and helpful, such as when you return to a shopping site that you go to frequently. But we wouldn't want our behavior on the Internet to be tracked all day, every day, from web page to web page by advertisers and marketers. That would be like wearing a name tag all day long and going through your day, knowing that your movements and actions were being tracked and recorded for future reference. Imagine if someone tagged you at a shopping mall, monitored which stores you went to and what you bought, and then used that information to bombard you with junk mail, telemarketing calls, and advertisements. That's essentially what cookies allow advertisers and marketers and marketers on the Internet to do. Here's how it all works: web sites often partner up with advertisers like Doubleclick, which happens to be the largest advertising company on the Internet. Those advertisers place banner ads on the web sites that they partner with. And through those banner ads the advertisers attempt to place cookies on your system from the advertisers themselves, not the web sites you're visiting. Those kinds of cookies are known as third-party cookies: you're Party #1 visiting a web site, which is Party # 2, but that web site has advertisements placed by Doubleclick, which is now Party # 3, and Doubleclick places a cookie on your system. The cookie you get isn't from the web site you're visiting, it's from a third party that places banner ads on that site. Now, let's say you leave that web site and go to another web site. Guess what? That new web site also uses Doubleclick for banner ads, and Doubleclick will read the cookie that you picked up at the previous web site and recognize you as a visitor to that previous web site. And so it goes: Doubleclick (and other advertisers) can now track and monitor your visits from web site to web site, compiling data about where you go and what you do. That data about your behavior is valuable, because it allows advertisers like Doubleclick to target advertising directly at you based on your interests and activities -- that kind of advertising is known as direct marketing. It's also an invasion of privacy. You may not have ever heard about Doubleclick, but Doubleclick most certainly knows about you. If you've never deleted cookies from your hard drive, then you undoubtedly have at least a few cookies from Doubleclick, and they've been using those cookies to monitor your behavior on the Internet for some time, probably from the very first day you brought home that brand new computer, logged on to the Internet, and went surfing. Bake your own Internet Cookie! selectively manage and delete cookies. 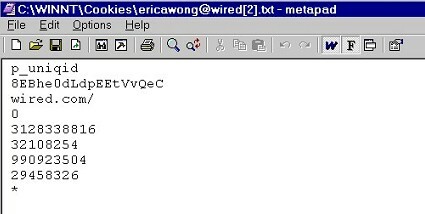 manage and delete cookies in Netscape Communicator, see THIS section. to filter cookies (block and accept them selectively), see THIS section. cookies (block and accept them selectively), see THIS section. Opera 6.0 & 7.0, see THIS section. And to learn how to delete cookies, see THIS section. If you've ever hit a web page that popped up other smaller web pages (esp. cartoon of some sort, then you've seen active content in all its glory. Not all active content is the same, however. Active content programs come in several different varieties. All of these different types of active content programs are created or built using different programming languages. Moreover, some of the programs are plain text programs (which you can actually read if you look at the HTML source code of a web page), while others are binary programs that are readable only by computers (they'll look like gobbledygook if you open them up and look at them yourself). So, What's the Problem with Active Content? to protect your computer system: active content, esp. ActiveX controls, are powerful technologies that can be exploited by malicious people (hackers, crackers) in some circumstances to do damage to your system -- "security holes" (software bugs) in these active content technologies can allow malicious parties to build web pages that can siphon potentially sensitive data off your system or delete files off your hard drive when you visit those web pages. page for Internet Explorer HERE. web page for Netscape Communicator HERE. Are Microsoft ActiveX Controls Dangerous? Indiana University - What is ActiveX? Indiana University - What are Active X Controls? Indiana University - What is Java? Be careful, some of the "tests" at those sites may crash your browser or even your whole computer.